Time Frequency Analysis – Listen, Inc.
SoundMap is an optional SoundCheck module for Time Frequency analysis. It is also available as a stand-alone product. The SoundMap™ Time Frequency Analysis module enables detailed analysis of signals simultaneously in both the time and frequency domain. It is ideal for impulse response analysis and detection of loose particles and Rub & Buzz in loudspeakers. It is also valuable for identification of transient effects such as drop out in digital devices including VoIP and Blue¬tooth headsets. 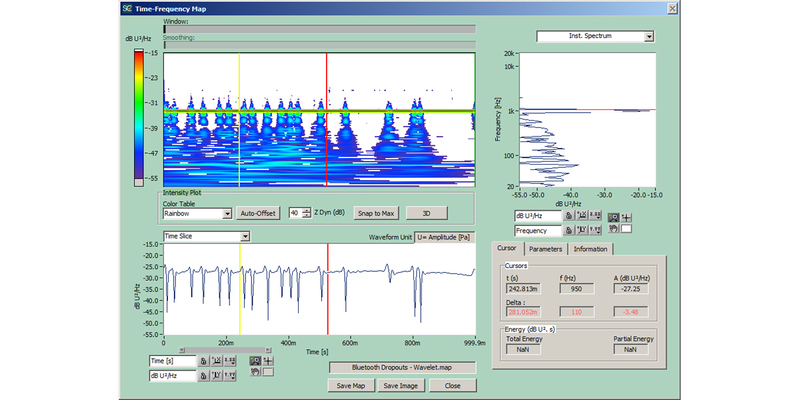 SoundMap offers far more flexibility than conventional ‘waterfall plot’ software, and more accurate and psychoacoustically significant analysis options. 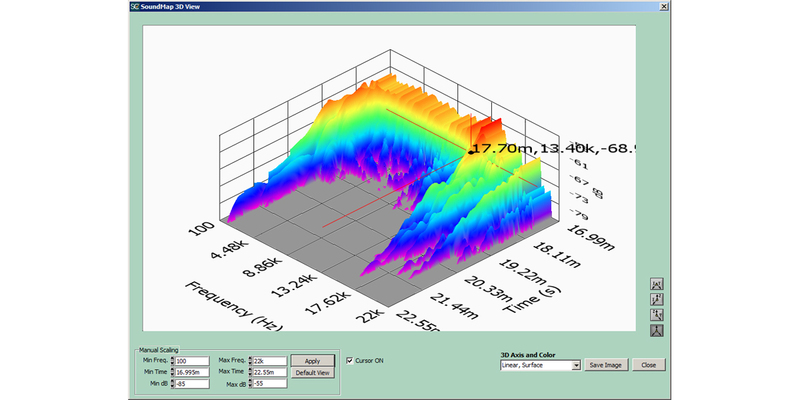 The software offers a variety of display options including 3D waterfall plot, intensity map with time and frequency slices, instantaneous spectrum, frequency time curve, time envelope and others. 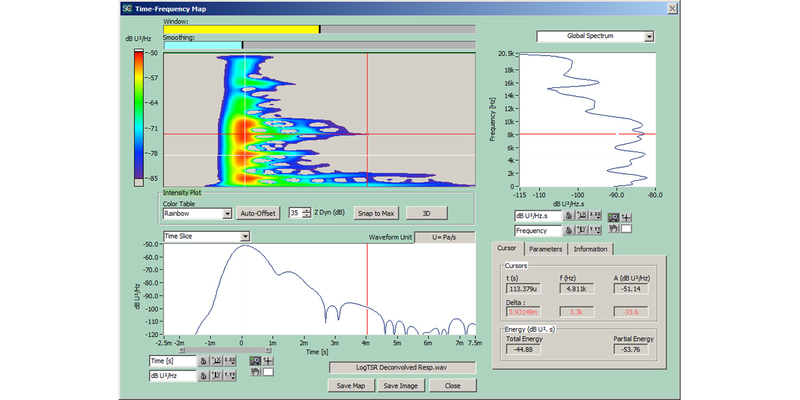 The ability to view a “slice” in either the time or frequency domain enables in-depth examination of any result. In addition to analyzing data collected in SoundCheck, SoundMap can read data from any WAV file, ASCII text file or even a MLSSA TIM file, therefore can be used to analyze data collected on other instrumentation. 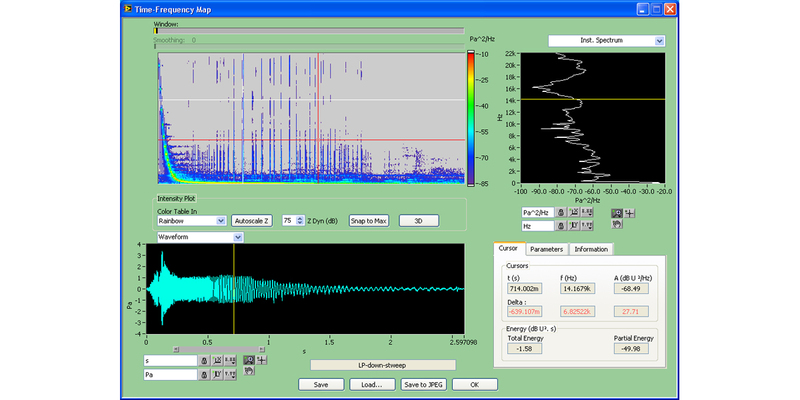 Cumulative Spectral Decay is the traditional tool for impulse response analysis of loudspeakers. It calculates the “ringing” of the loudspeaker for each frequency using the impulse response. Data can be output in a variety of formats including the widely-used three-dimensional ‘waterfall plots’. The Short Time Fourier Transform is a general purpose algorithm which enables observation of the spectral changes of a signal over time. This method is ideal for the detection of manufacturing defects such as loose particles and Rub & Buzz in loudspeakers, measurement of settling time and ringing in devices including loudspeakers and telephones, and analysis of dropouts, discontinuities and instabilities in digital devices. Wavelet analysis differs from CSD and STFT analysis in that it uses constant percentage bandwidth rather than constant frequency bandwidth. This offers better time resolution at high frequencies and better frequency resolution at the lower end of the spectrum. This is advantageous as it is more psychoacoustically significant and it is easy to see the entire 20Hz – 20kHz spectrum in one picture. Applications for wavelet analysis are generally the same as for STFT analysis described above; the algorithm selected depends on whether constant frequency or constant percentage bandwidth is preferred. Wigner-Ville is the ultimate algorithm for detailed analysis of very short events, for example fine analysis of transients or in-depth observation of rapidly evolving signals. Offering an output resolution of one spectrum per sample, it is the maximum achievable precision. It complements the more commonly used analysis methods discussed above. Choice of color scales: Rainbow, Fire, Sunset, Grey Scale, etc. 2 horizontal cursors coupled with the ones on the map. STFT: Short-Term Fourier Transform with Gaussian window. WV: Smoothed Pseudo Wigner-Ville Transform with 2 independent Gaussian windows. Implemented in analytical form. CSD: Cumulative Spectral Decay with Cosine-Tapered (Tukey) Window. Low frequency limit inverse of window duration. Wavelet: Gaussian Analytical wavelet (Morlet). Fractional octave bandwidth and center frequencies. Global Energy Spectrum†: power sum of all spectrum of the multispectrum. Sub-Total Spectrum†: sum of all spectrum of the multispectrum, between the 2 verticals cursors. Energy Calculus†: sum of all time-frequency values of the whole multispectrum for the total energy, or in the box delimited by the 2 cross-cursors, for the partial energy. Energy-Time Curve: sum of all time slices of the multispectrum. Partial Energy Time Curve: sum of all time slices of the multispectrum, between the 2 horizontals cursors. Group Delay Curve†: centroid of each time slice over frequency. Instantaneous Frequency Curve: centroid of each frequency slice over time. The functions denoted by † are only available when Analysis is complete (Gap Free). There are 2 SoundMap versions available. Part# 1300 is the full version which includes four analysis algorithms: Cumulative Spectral Decay, Short Time Fourier Transform, Wavelet and Wigner-Ville. Part# 1301 contains the Cumulative Spectral Decay algorithm only. This makes it an ideal replacement for MLSSA’s popular waterfall feature. SoundMap is available as a module for your SoundCheck system, or as a stand-alone product. Please contact sales@listeninc.com for pricing information.